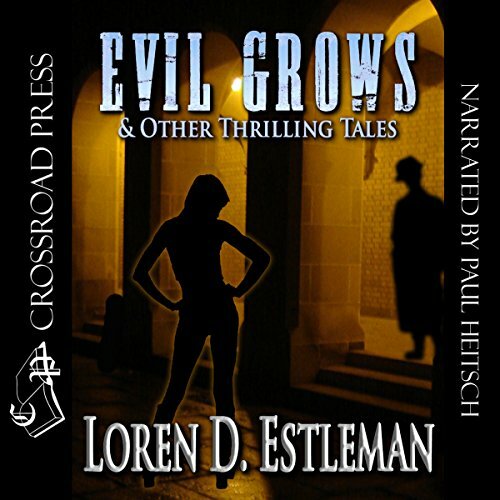 Evil Grows & Other Thrilling Tales collects nine offbeat tales of murder written by best-selling author Loren D. Estleman. Would you consider the audio edition of Evil Grows & Other Thrilling Tales to be better than the print version? What was one of the most memorable moments of Evil Grows & Other Thrilling Tales? I liked all the stories...but the 1st one and the last short one, were my favorites! this would make a great tv mini series! This was a great collection of short mystery/thriller stories and is very well narrated! I listened to it all in one day and enjoyed it very much...if you like thrillers, and unexpected twists...this will keep you entertained for hours....I recommend!!!! Running time: 4 hrs. 39 min. This book is a lovely little collection of 8 noir stories reminiscent of Raymond Chandler and such movies as Double Indemnity and On the Waterfront. The writing is lean, yet evocative. The author can, like the greatest of Chinese and Japanese painters, draw an absorbing picture using as few words as they do lines, yet I was immediately caught up in the story, the characters, and the settings. One of the things I liked best about this all too short collection is that there are a variety of settings, ranging from the seamier side of a large city to mountain back woods to a Bishop’s manse. In each case, the setting is vividly rendered and came to life in my mind’s eye with the clarity of a movie. The characters are handled with equal skill, though don’t expect to like or sympathize with most of them. There are, of course, a few exceptions ..and a couple of villains who absolutely delighted me, and for whom I had not only sympathy, but wanted them to succeed in their endeavors. Some of these were rough justice, and some revenge …and my instinct was that, given the situation in which they found themselves, I well might have considered doing the same thing. Some characters are pure nastiness, but are extremely fascinating in the same way a cobra fascinates behind the protection of very strong safety glass (or whatever zoos now use). I found myself hypnotized by them, possibly because it was so hard to relate to them, and I was very glad that we had very little, if anything in common. The plots are tight and very well developed, and, while some stories share elements of the same plot scenario, I never felt I was reading the same story told over and over again with slightly different flourishes. Instead, it was more like walking around a particular sculpture and viewing it from different angles, or thinking about a particular incident and then playing “but what if ..” with it. Some of the tales are very short, with a scorpion sting at the end that made me gasp, and some are leisurely strolls through the darker side of life, mind and motivation, but each story is like a perfect pearl on a necklace, worthy of examination in itself, and lovely as a part of its environment. The narrator was perfect for this book. Like the author, he could deftly portray many different characters, each of whom was unique, and handle speech patterns and regional dialects with graceful competency. His narration added sparkle and depth to an already excellently written book, thus giving me an engrossingly satisfying experience that engaged both mind and senses. I received a free copy of this book in exchange for an honest and unbiased review. Despite not having read the print version first, there is no doubt in my mind that the audio version is better simply because of how well Paul Heitsch voiced the stories. They were great on their own clearly, but the addition of his efforts definitely added to the overall ensemble in a way that just text would never have been able to reach. What I liked best about the stories, is the twists that I've come to expect while reading through short stories of all sorts of genres. The number of double crosses and situations in which winning wasn't an option numbered as high as the number of stories involved. In some cases the author keeps the extra information from the reader, but the involved character's actions reveal that something's not kosher while in other stories people who have been involved in hard lives get a glimmer of hope before it's smashed out by the boot of the next guy on the totem pole. As I mentioned in the beginning of the review he gives the characters even more character than the author had an opportunity to write in. His emotions behind the characters made them seem more real and had me personally rooting for at least a few characters who I knew were going to lose in the end but I couldn't help myself. If there ever was a book that I would want to do just that for, it would be this one just because it was somewhat short but had all the excitement and intrigue and mystery of a book several times longer. I received the code for this audiobook for free in exchange for an honest review and honestly could see myself reviewing more of either Estleman's writing or Heitsch's performances because of how much I enjoyed this book. I'm sure it was. For me, I can never really become invested in thrillers or mysteries when I try to read them. Audio versions are great for books like this because you really do get to feel like you having a story told to you. Paul Heitsch was a wonderful choice for narration with this collection. Not only is he a great narrator, but he was able to bring personality to each character throughout. My favorite was actually the first one. Evil Grows. I enjoyed the slow build and payoff at the end. These are short stories, so it's nearly impossible to describe any of them without giving anything away. I have never read/listened to anything from Loren D. Estleman, but this collection has made me want to search out another full length book to see if I really like him. The narrator was also great, and I plan on going through his other narrated titles to see if I want to pick any up. Disclaimer: I received this audio book for free from audiobookblast in exchange for an honest review. This is a delightfully dark noir glimpse into the worlds of the criminal underbelly. Less a gruesome, blood-spattered attempt at gore, more an in depth peek into the minds of those who kill in a kill-or-be-killed criminal underbelly. The writing is tight and dynamic, not wasting words even in intense descriptions that draw you in like quicksand. Imagine yourself strolling along, glancing around and something catches your eye. You stop to study it. It’s a movement in the tree ahead, a shadow just at the edge of your vision. While you’re trying to determine a flight or fight response, the ground beneath your feet loses substance and your feet sink just a bit. That shadow could be a mugger or a neighbor, so you stand there and wait for it to move again. And your feet sink just a bit more. Without realizing it, you’ve remained in the same spot long enough for the quagmire to reach your knees. Just when the edges of panic creeps into your mind, the ground spits you out onto the sidewalk unceremoniously and disappears. This is the effect of these short stories. They are subtle. They are sneaky. Just when you think you know what that shadow is, you feel the quicksand’s pressure on your knees. Not for me but check it out for YOU. I really enjoy horror books of almost every type, but for some reason, this book just did not resonate with me. The narration was good and I didn't run into a problem with the writing or anything, but it just didn't click for me. I need to have my books grab a hold of me and not let go...and this one just didn't do it for me. I even tried skipping to a different tale (since it's a set of stories), and it didn't fit for me. That being said....it DOES have a 5 star review, so maybe it is just me. Give this book a chance and see what YOU think. 3.5 STARS. This is the first short story book that I have ever had the pleasure of reading/listening to that I didn't like. Every story seemed to be incomplete. I receive this free for an honest review.